Boedekker Park has a half-basketball court, play structures, and a clubhouse. It is owned by the San Francisco Recreation and Parks Department. It is scheduled to be renovated in 2011. 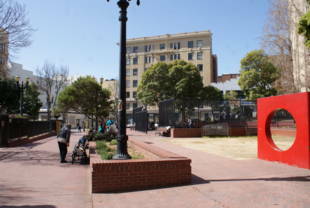 An urban oasis in the Tenderloin opens with hope and trepidation' said the San Francisco Examiner when Boeddeker Park was dedicated in May 1, 1985. The two-and-a-half acre site, originally named Central City Park, extended from the corner of Eddy and Jones (former home of the Downtown Bowling Alley) to a midblock section of Ellis between Jones and Taylor. 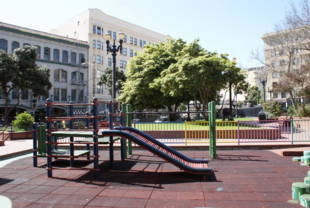 Funded with over $3 million from the Open Space 'High Need Program' and $200,000 from the Mayor's Office of Community Development, the park was created to provide green space and recreation for the Tenderloin's 2,500 residents mostly comprised of seniors, Southeast Asian parents and their children. It was designed to survive in a neighborhood notorious for its sub population of drug dealers, drunks and vagrants. The park featured a six-foot fence with spiked tips, low-lying shrubbery, brickwalled terraces, and wrought iron benches whose seats with metal dividers were impossible to sleep on. A wide brick pathway enabled police to drive a patrol car straight through from Eddy to Ellis. At the opening, Mayor Dianne Feinstein renamed the park for Father Alfred Boeddeker, the Franciscan priest who established the nearby St. Anthony Dining room. 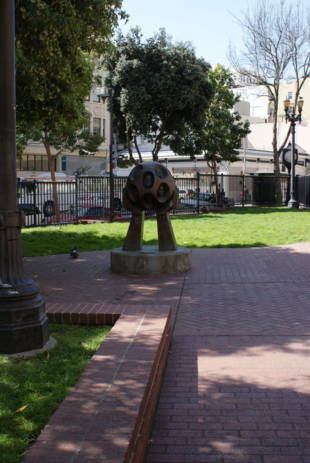 A year later, the park's first anniversary was marked by installing two original sculptures- Bruce Hasson's ark, symbolizing the park as sanctuary for neighborhood families and Tenderloin resident Anthony Smith's pair of hands cupped around a globe inset with life-size faces of twelve residents, representing the rich variety of cultures and ages in the Tenderloin community. That anniversary year ended with a press report of angry, frightened children writing letters to Mayor Feinstein about 'bullies and drunken men in the park' and saying 'we can't even play in the park any more.' The problems and the battle to solve them continued. 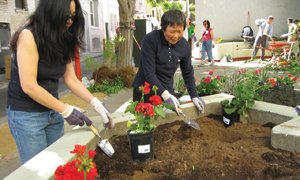 Funding from the Mayor's Public Space Improvement Program planted the seeds for a community garden in 2001 and the SF League of Urban Gardeners (SLUG) turned the $42,546 grant into a plot of fragrant flowers and edible herbs. 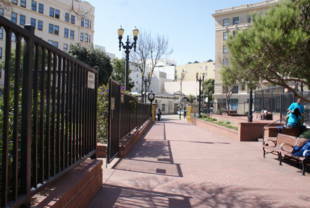 Fast forward to '04, Boeddeker Park has a new Friends team and new ParkScan technology. ParkScan, funded by a grant from the Alfred P. Sloan Foundation, is NPC's pioneering program that sends trained volunteers out to inspect and record conditions in the parks. Armed with handheld computers and digital cameras, they document their findings- everything from clogged drains to dead pigeons in the garden- and send them electronically to the Recreation and Park Department before posting them on the internet (www.parkscansf.org). Working with the new Friends group since it emerged a year ago, Daniel Stein joined ParkScan last fall. He reports clear signs of progress, noting that 'Rec and Park is much more responsive to our complaints.' With the arrival of park supervisor Thomas Wang, the once garbage-strewn, neglected garden is clean and beautiful, filled with thriving new plantings. And the disruptive drug gang that hung out and played dominos at the adjacent game boards has largely disappeared with posting of longsought 'No Dominos or Loud Music' signs. Recreation director Robert McDaniels recently posted the summer program ranging from Cooking for Kids to Senior Bingo, Tutor Homework, and Weight Lifting. In March, Friends of Rec and Park's (renamed San Francisco Parks Trust) Project ReCreation devoted its one-day program to Boeddeker, making visible improvements both indoors and out including a new wall mural and bike racks. Daniel's wish that, 'in a year, I hope we'll all be able to sit down in a peaceful park,' is shared with the gentle man who gave the park its name. At the groundbreaking 21 years ago, Father Alfred Boeddeker prayed, 'May it be peaceful.' The hope seems on its way to fulfillment.